Historic landmarks, breath-taking landscapes, high octane adventures, relaxing time out, a truly authentic Irish experience awaits in Tipperary, the undiscovered gem of Ireland’s Ancient East, the true heartland of the island. This March sees the launch of a dynamic new tourism vision for County Tipperary. 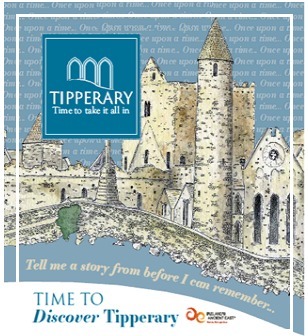 The initiative has been developed by Tipperary Tourism, a joint task force of members of the tourism industry from across the county, supported by Tipperary County Council. The aim is to showcase the abundance of visitor experiences that Tipperary has to offer, from ancient sites to historic landmarks, vibrant activities, authentic cultural trips, fun-filled family adventures, gourmet treats and contemporary hospitality offerings. Visitors have an abundance to enjoy within the county, and its central location makes it the ideal hub for touring across the provinces. With its lush and fertile lands, Tipperary was home to many wealthy Irish dynasties in years past, who left behind a fascinating landscape of imposing castles, medieval architecture and intriguing follies. The chronicles of Christian Ireland are rooted in the lands of Tipperary; diminutive rustic parish shrines give way to colossal monastic ruins at every turn of the road. The lands, so fiercely fought over for aeons, now produce food and sustenance that is lauded across the world. Tipperary’s landscape is a rich pageant of diversity, from soaring mountain ranges to serene lakes, and miles of verdant pastures, surging rivers through ancient bog lands. In towns and villages throughout the county there’s a happening, a gathering, a festival, a session, no special occasion needed, where arriving visitors leave as locals. Tipperary Tourism have uncovered the hidden gems of Tipperary and made them accessible to all with easy to follow routes and downloadable trails, suggested itineraries and trips, sporting and outdoor adventures, family fun and much more. 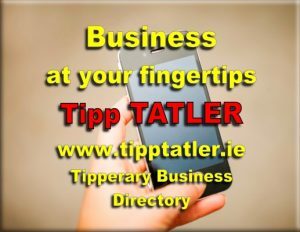 These are all available at www.tipperary.com, which is user friendly across all mobile devices. Culture vultures can roam Ireland’s most ancient lands on the Sacred Ireland Trail, a two-day self-guided tour, uncovering the myriad of abandoned monasteries, castle ruins, shrines and tombs that lie hidden throughout the stunning Tipperary landscape. Tour Nenagh Castle steeped in history and tales of medieval Ireland. In the village of Lorrha, explore the Augustinian Priory and Lackeen Castle Sail through time on the sacred waters of Lough Derg, marvelling at the gospel stories told in stone, intricate high crosses and cloud-tipping round towers, built more than a thousand years ago. And on to the spectacular Rock of Cashel, seat of the Kings of Munster, one of the Europe’s most important medieval sites, a breath-taking monument to Celtic art and architecture, overlooking the Golden Vale. Journey on to Holycross Abbey, a national landmark, home to sacred relics, medieval sculpture and much more. Take an unforgettable guided Sunrise Walk with Climb Ireland through the Devil’s Bit, the Galtee Mountains or Lough Derg and discover mountain lakes, waterfalls and age-old bog land, teeming with wildlife. Those who prefer a holiday packed full of adventure will enjoy kayaking, water-skiing, river swimming and cycle trails along the River Suir and the world-renowned Lough Derg, Ireland’s largest inland lake. Hikers and climbers will be challenged by the rugged slopes of the Galtees, Upperchurch, Slieve Felim and Knockmealdown Mountains. Saddle up for a mesmerising pony trek through the Glen of Aherlow. Grab a bike and enjoy some great cycling routes around the town of Nenagh or take a gentle ramble with all the family on the towpath from Carrick to Clonmel. For those who want to slow it all down, reconnect with loved ones and de-stress, the breath-taking beauty of County Tipperary is truly inspirational. From gentle strolls through the county’s lowlands, to pottering about local Farmer’s Markets, visiting craft workshops or enjoying relaxing outdoor painting courses, taking time to take it all in is at the heart of the Tipperary experience. Golfers will be spoilt for choice with numerous championship courses throughout the county. Cruise Lough Derg at your leisure or enjoy world-class angling on the River Suir. Recognised internationally for producing some of the world’s best equine stock, Tipperary is now home to the Fethard Horse Country Visitor Experience, due to open soon. A paradise for horse enthusiasts, this brand new immersive experience will bring to life the 5000-year relationship between man and horse in the Golden Vale. 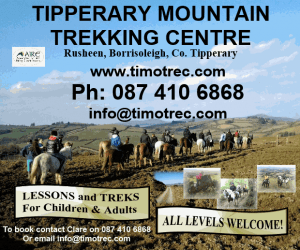 Accommodation in Tipperary ranges from wonderful family run guesthouses and B&Bs through hotels, as well as self-catering, camping and caravanning facilities in stunning lake and mountainside locations. As the heartland of farming and agriculture in Ireland, the food offering in Tipperary is a true reflection of Ireland’s best produce – fresh, homegrown, hand reared, sustainable – harvested today and on the plate the same evening. Many of Tipperary’s restaurants and chefs are growing in national recognition; gourmands can enjoy contemporary fine dining, international cuisines, as well as hearty, authentic Irish cooking and baking. No visit to Tipperary is complete without the signature Tipperary Breakfast, created by internationally renowned Tipperary native and two Michelin star chef Kevin Thornton, in partnership with the Tipperary Food Producers Network. Each ingredient is Tipperary born, grown and harvested, literally ‘Tipperary on a plate’ and can be found in hotels, restaurants and cafes throughout the county. Watch the world go by sitting outside a chic town café or enjoy a creamy pint and music session in the numerous pubs throughout the county. Artisan food is plentiful, from dairy and meats, through ciders, beers and wines, confectionary and crisps, preserves and much more. Tipperary’s independent producers create world-class products from the bountiful harvest provided by local lands, farms, orchards and hedgerows. Tipperary is an unspoilt destination, undiscovered by many yet easily accessible to all with its links to the M7 and M8. Its unrivalled central location means that Tipperary is the ideal base for touring a multitude of Irish destinations, from the Cliff of Moher in Clare, to the old-time seaside resort of Tramore in Waterford. Head to the buzzing city of Cork for a day or drive to the enchanting Birr Castle Gardens in Offaly for a few hours. The historic Limerick city is just a short drive, while Kilkenny Castle is a stone’s throw from Tipperary. Visitors making their way from Dublin to Kerry will find Tipperary the perfect midway respite. The undiscovered heartland of Ireland, Tipperary is abundant in authentic, yet-to-be discovered experiences that are rooted in a land more ancient than the historic buildings that remain. Historical Ireland combined with contemporary living, warm, genuine, vibrant, time to take it all in – discover Tipperary. See www.tipperary.com for full details.